A simple and wonderful side to anything you may already be grilling. You can also make this recipe in your oven. Wash and slice the sweet potatoes into 1 inch discs. 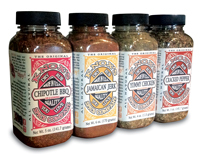 Brush with olive oil and sprinkle with equal parts Knox's Jamaican Jerk dry rub spice blend and brown sugar. Start your grill and push the hot coals to the edge for indirect grilling. 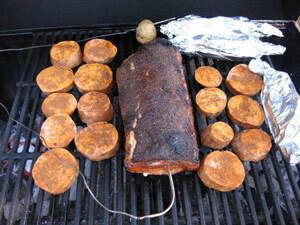 Place sweet potatoes on hot grill grates and close the lid. Flip after about 15 minutes and continue to grill until they are soft when you push a fork into them. Great side for pork, fish and burgers.